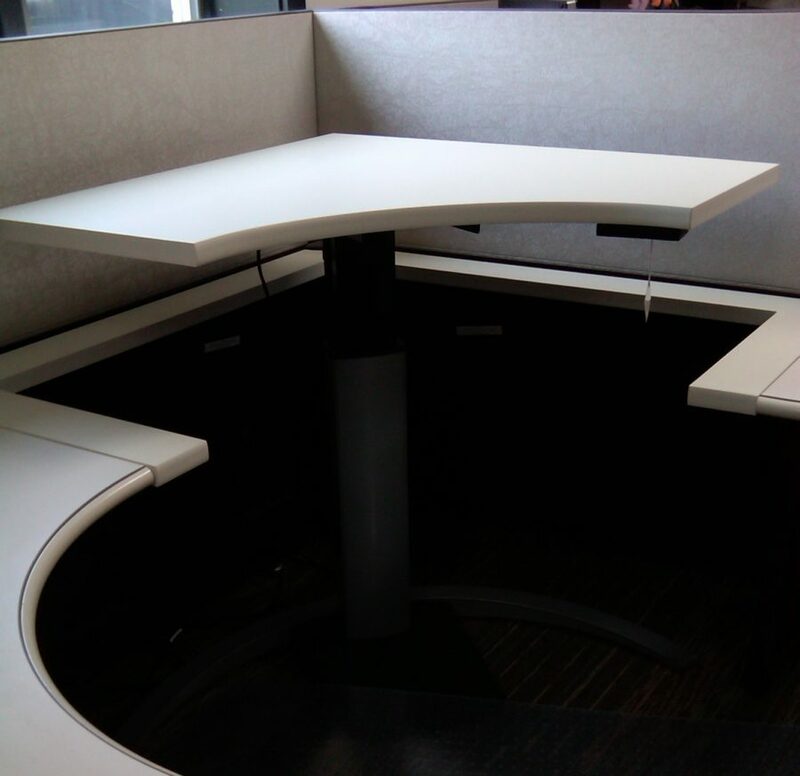 The growing popularity of height adjustable desks in the work place has led to a demand for creative ways to implement the desks outside of the standard rectangular packages. As ergonomics specialists we know that the correct set up of a work environment is critical to productivity. But, we also understand that some situations, whether because of the employees desire for originality or the space’s limitations, call for different ways to set up height adjustable desks. The cockpit design is a ergonomic curved edge in the front of height adjustable desks. This curved edge, which we call ergo on our own desks, allows users to more easily access the entirety of their desks. On a correctly cut ergonomic edge, the user will also have a gentle ramp to rest their wrists on making the desk more comfortable during prolonged typing periods. We have had many offices come to us to fix this problem of “employee reach,” where the continuous stretching of employees throughout the day to grab office material places a great deal of physical stress on their bodies. Our ergo desk, pictured left allows people to eliminate the employee reach. Over our 20 years in the industry, we’ve had a number of cases in which a company desired to have a height adjustable desk in a location where they didn’t have room for a base or wanted to save as much room as possible on the floor. In these situations, we recommend a wall track unit. Pictured to the left, a wall track unit gives you all the range desired in a height adjustable desk, moving from 20 inches at the lowest to 200 inches at the maximum. As you can see form the picture, the base of the unit takes up less than 8 inches on the ground and still provides a large enough work surface to be feasible. To maximize the work space in this unit, we added a monitor arm to get the monitor up and off the surface itself, both positioning it better for use and saving additional work space on the top. Wall track units, a favorite in the medical industry, are a great solution for those who want height adjustable desks, but do not have a lot of floor space to work with. Many offices across the country use office cubicles because of their cost effective installations and convenient space splitting features. A lot of these cubicles are pre-fitted with stationary desks and tables that are attached to the cubicle’s walls. Fortunately, you can still place a height adjustable base under an already existing top to inexpensively create a height adjustable workstation. To do this, all you need to do is buy a height adjustable base, like ours here, and install it under your existing surface. As you can see from the picture on the right, using a single leg base, you can quickly create a height adjustable desk from an already your current cubicle set up. This process of using only a base is a very cost effective way to retrofit existing workstations.